Two master musicians, friends of twenty years, and musical companions are back together on To Know Where One Is. Bassist Ed Schuller and tenor saxophonist Joe Lovano ensure a brilliant recording, as they've proven in previous outings. But To Know Where One Is also has trombonist Gary Valente, drummer Billy Hart, and guitarist Bill Bickford (from Schuller's highly praised Eleventh Hour Band) on hand as well. Schuller has works with Lovano's band Symbiosis and accompanies Lovano on the Blue Note Records release Rush Hour. Bassist/composer Ed Schuller, son of composer/conductor Gunther Schuller, is found of The Eleventh Hour. The music is comprised of Schuller's compositions, drawn from many styles and influences. To Know Where One Is is the group's first GM release, having previously release Mu-Point and Eleventh Hour on the Tutu label. Schuller has performed previously with (among others) Pat Martino, Dewey Redman, Bill Frisell, Lee Konitz, Mal Waldron, Julius Hemphill, John Lewis, Jaki Byard, the Paul Motian Quintet, the Tim Berne Quintet, Clark Terry, and Red Rodney, making appearances worldwide from Carnegie Hall to the Philharmonie in Berlin to numerous jazz festivals. 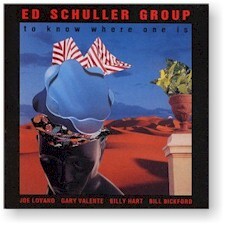 "[Ed Schuller] has sure pitch and a rich, deep tone which I haven't heard better represented on record." "...this is an excellent album ... marvelous ... plenty of surprises here." "Schuller's solos are marvelously fragment, deftly played sound mosaics ... his music has form, structure and grace." All compositions by Ed Schuller, except as noted. Recorded on 7-8 February 1994 at Waterfront Studios in Hoboken, New Jersey.